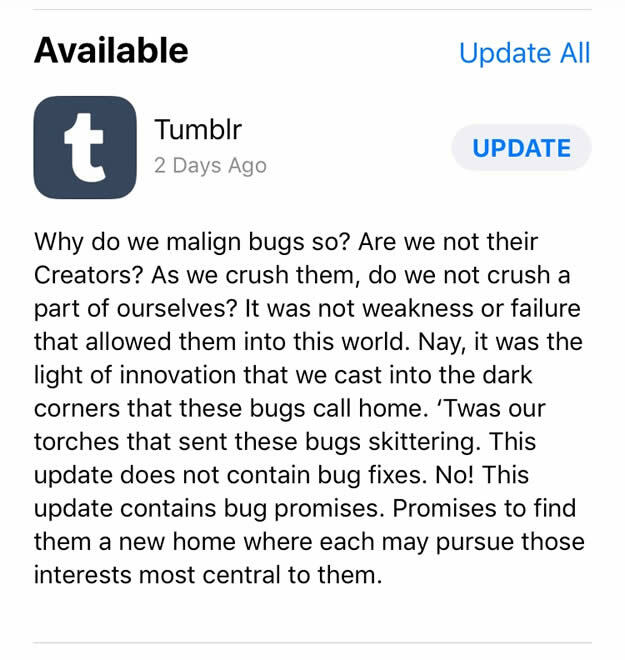 Whoever wrote this sublime Tumblr app update description, I bow before your greatness. Never miss the opportunity to make something awesome. The copy: Why do we malign bugs so? Are we not their Creators? As we crush them, do we not crush a part of ourselves? It was not weakness or failure that allowed them into this world. Nay, it was the light of innovation that we cast into the dark corners that these bugs call home. ’Twas our torches that send those bugs skittering. This update does not contain bug fixes. No! This update contains bug promises. Promises to find them a new home where each may pursue those interests most central to them. Sharing makes you cool and everyone will love you. This entry was posted in going critical, jus' some writin' and tagged apps, copy, copywriters, copywriting, tumblr, updates, writers, writing on September 24, 2017 by Clayton Hove. Sign up for boney post alerts! Categories Select Category admacro ads of yore bonepoll branding branding irony cats chart to the bone commercials design experiments food frieze frame going critical hyperbole jus’ some writin’ legerdemain lists magazines mascots! mashup oops packaging parody product! Quiz from Hell quote social media totally off topic Uncategorized what the…! ?